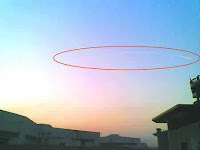 What we have about a certain object seen over China, are press reports. We do not have direct testimonies of witnesses –a task for Chinese investigators— and, so far, we also lack of an official report. The event happened on the night of July 7, at approximately 9pm. local time. Originally it was reported by a pilot, who found the phenomenon on the air, and by authorities of the local airport. But the news only came out on July 15. Therefore, there was a delay of 8 days for the news to reach the public of the World. Other source establishes that the airport remained closed for one hour. Dealing with the news reported by the press, the first thing that we realized was that there were apparently two different phenomena, or two different characteristics of the phenomena when we compared still picture (left), and a video (right). "Unfortunately, this video is not from Hangzhou but from Kazakhstan and was taken on June 30th and shows a Progress M launch from the Baikonur," Forden said. The rocket seen here, in other words, was a routine launch to resupply the International Space Station. "It looks so strange because the upper stages have already left the earth’s atmosphere and the plume has expanded to many kilometers. It's very unusual to see this from the Earth's surface (and very interesting since it shows the transition from one stage to another) but it is not a black-ops rocket at all." Nevertheless, what was really seen by the control tower operators and authorities at the Xiaoshan airport is not totally compatible with the pictures obtained by the press. Reporter: “Airport staff say the first reports of the UFO came in just after 8 PM from both air traffic controllers and civilians. The object at the center of the commotion, visible as a light in the sky, was captured in this photo. It may not look like much but it does not belong to a civilian aircraft. Nor does it match the flight plan of any aircraft supposed to be operating in the area at the time. …. Also the Daily Mail reported on July 16 that: “Chinese officials later said that they knew what the object had been but were unable to make it public because there was a 'military connection.' An official statement is expected later today.” But the official statement never came, so far. Maybe was this missile. But it could also have been a new and secret airplane or UAV that the Chinese were testing. 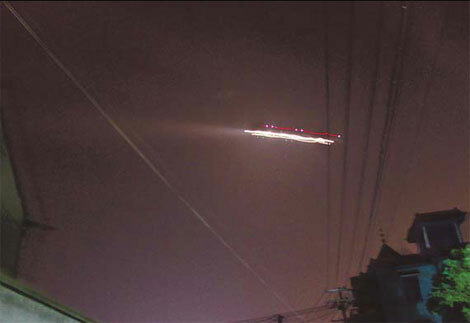 How do you explain the China UFO sighting in the video above? From this poll it is clear a difference of 11.46% in favor of a Chinese military exercise, over the Extraterrestrial life. This is outstanding; it is really a good sign that the mentality of the people is changing. Moreover, if we sum-up the percentages of the Chinese military exercise, the Foreign satellite or spy plane, and the Natural phenomenon, they overcome the Extraterrestrial life explanation by an overwhelming 30.98%, taking into consideration that there is a significant 21.66% that has Not a clue.